Hand Wash plus is perfectly balanced to leave your skin exceptionally clean and freshly scented. Together with hand repair. Its the only answer to soft an silky hands. It helps reduce fatigue and improve motivation. Hand Wash plus rich and creamy is the only way to describe the luxurious lather of Deep streps foaming hand wash. As instant foam gently cleaners your hand. 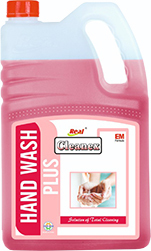 D Provides Hygienic & Clean Wash D Pleasant fragrance,Long lasting fragrance D Specially include rich foam, and easy to wash. D Strong effect of cleaning D Gives your hand soft feeling D Friendly for both children and adult. Perfect for any commercial setting including schools, offices, restaurants, daycare and more.